Energy, an important part of prepping that usually is forgotten about. It’s something we take for granted right now, but in a SHTF scenario, we all will be thrust into a harsh new reality of a world without the grid. Everyone would like to think they could get by without continued power, and they very well might, but some power sure could make life a whole lot easier. So the first question is, what exactly do I need power for in a SHTF scenario? More than you might think. First, the survival uses: water pumps, powering your radio & portable 2 way radios, using a GPS to navigate (GPS Satellites are solar powered and independent of any ground station, and thus will continue to function in most SHTF scenarios), electric water purification systems, charging car batteries, small DC refrigerators, light bulbs, battery systems for solar generators, and for AA/AAA batteries for your essential gadgets, among numerous other uses. On top of the practical uses, I think keeping group morale up will be a big factor when it comes to effectively surviving a SHTF scenario. Giving you or your family the ability to watch a DVD here and there, listen to music, and other small conveniences that we take for granted now is sure to keep group morale up. So the second question is – How can I power all of these things? 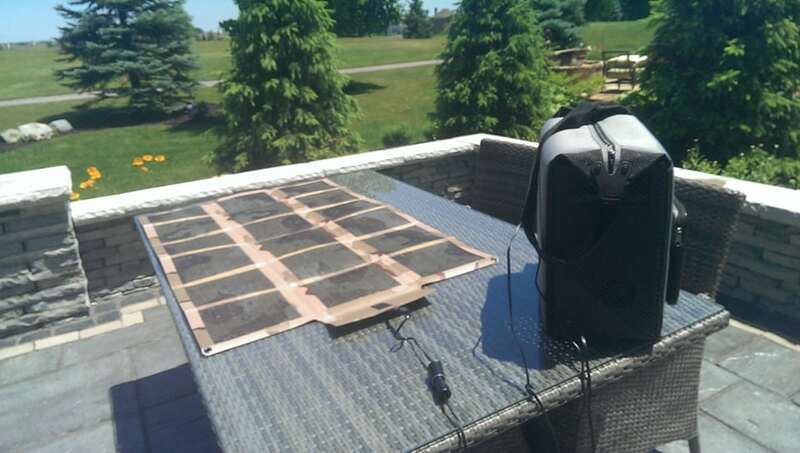 Well in a SHTF scenario, I think having some type of portable solar charger will be very advantageous. These portable solar chargers are measured in Watts (Volts x Amps), and they are not your everyday solar panel like you have on a house. These portable panels are specially designed to have the perfect voltage for their intended application, and are designed to be very portable and easy to use. These panels are almost always designed to fold up to a compact size, and are usually made with flexible & lightweight thin film solar cells, making them a good choice for a bug out bag. A good portable panel will require very minimal technical knowledge, as you only really need to find out what wattage suits your desired application best. Below is a quick reference table to help you in buying portable solar chargers. Author: Luke Zimmerman, owner EndlessSunSolar.co and sponsor of ModernSurvivalOnline.com. Great post. I’ll have a look at your web page. I bought some of the Brunton large folding solar cells years ago to power a sat phone in Africa and they worked great. Recently bought another smaller format folding solar cell that directly outputs to a USB for charging devices with those type connectors. All of these solar cells have been EMP protected and buried in a cache devoted expressly to rechargable Sanyo Eneloops (with C and D adaptors) and CR-123s and their associated 12vdc chargers. Of course, I added a couple of multi-band HT’s to the box (most of my HTs are stored elsewhere including four of the wonderful Garmin FRS/GMRS/GPS HTs) and a few of Surefire’s wonderful lights. GPS is nice and it has invaded our navigational life. It can be purposefully degraded or even encrypted to prevent enemy use. Left to its own without regular time updates, the atomic clocks soon drift so as to reduce GPS accuracy. Next to my commercial vacuum and impulse sealers, one of the best investments was in a large format laminator. These are surprisingly cheap and work so well. A Brunton compass and laminated topographic page size maps of the area went into the battery cache as well. Thank you, if you have any questions regarding anything on the website or any technical questions, be sure to email me at [email removed – invalid domain]. The Brunton folding solar panels are a great panel, I love their use of CIGS cells on many of their units, but I’ve found them to be overpriced, so that they can have the Brunton name. That’s good to hear they worked well though, they would be great in Africa without a doubt. The folding USB type’s are especially useful for small electronics, I’ve used quite a few different kinds, and have found that the amorphous a-Si panels like the NOMAD I sell are my favorite. They are less efficient, but with their high shade tolerance, I’d trust my life to charge one if I had to choose a USB type charger. That sounds like a great setup you have there though, how do you though how do you EMP proof the solar cells? And I agree, having paper and manual backups for electronic devices is definitely an important part of being prepared. Redundancy is vital! It’s a good panel for sure! But wow, that’s sad that so many were destroyed. Those really could have added up over the years! It would be difficult to string them together, but assuming you would’ve got them for free, it wouldn’t really matter! And wow, north Texas is an great spot for solar! That sounds like a bad drought though, I would definitely focus on water conservation, but also don’t forget about purification! If on a budget, you can easily pick up a small solar charger with a USB AA/AAA battery charger. It’s a simple way to keep your smaller electronics charged up but also to keep AA/AAA’s ready, which are pretty important. I recently got some USB AA/AAA battery chargers with some batteries that should be up on the site soon, they should be an affordable starter kit into solar energy! I hope you can get the water issue sorted out though, that sounds like quite a problem. Definitely would like to have the solar panel in the second pic. I work at a Chevy dealership that also has a VW franchise and 12-13 years ago, all new VW’s came off the transport with solar panels to keep the batteries charged during transport. So many were given away and thrown out, nobody wanted them, including myself. Now that the great country I lived in is gone, (at least in my opinion) and it don’t look very bright for the near future, I wish I would have kept some of those panels. Hind sight is 20-20 for sure. Been looking at solar equipment, but living in N. Tx. we are in a stage 4 drought with lake levels at 20-25%, couple that with the water crisis that just happened in W. Va. my main priority is water collection and storage. I enjoyed the post though and do plan to direct my attention to energy as soon as can. I couldn’t access the endlesssunsolar web page. Anyone have that problem? Luke, Re EMP protecting solar cells, you might be interested in a post of mine regarding same for radios and electronics. Small format solar cells are protected the same way. They are emplaced in metallized foil sealed and electronically isolated nesting metal cans. Make sure you are going to EndlessSunSolar.co, not .com! See if that works. To reiterate, there are no rechargeable AA or AAA like the Sanyo Eneloop. These are the very best.